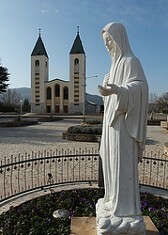 Many years ago, I made three visits to Medjugorje, an apparition site, in the former Republic of Yugoslavia. One of the messages that was given by Jesus' mother Mary was to pray for children. And so beginning in 1990, I started praying for children. I do not have children of my own so I was praying for children in general. After doing this for some time, I began to notice children in away that I had not before. It was not that I disliked children before; it is just that I never payed much attention to them. It was as though Jesus put something in my heart that was not there before. I continue to pray for children to this day. I became aware that the children, who seemed to want attention were children who had little or no father image in their life. When I began to see this in little children, I would leave my complicated world and enter their innocent simple little world. I found that with little children, you don't have to entertain them; they will entertain you. You just have to let go, listen and talk to them about whatever they want to talk about. You will leave with a joy in your heart and a memory that you will never forget. I would really encourage people (especially men) to pray for and pay attention to the little children in your life. And if you have never done this before, pray for and bless your adult children and grandchildren. Jesus will put something in your heart as well and you will experience a new joy. Remember this, when you receive the little children, you receive Jesus. Whoever receives this child in my name receives me, and whoever receives me receives him who sent me (Lk 9:48)! True Greatness, Matthew 18:1-6: At that time the disciples came to Jesus, saying, “Who is the greatest in the kingdom of heaven?” And calling to him a child, he put him in the midst of them, and said, “Truly, I say to you, unless you turn and become like children, you will never enter the kingdom of heaven. Whoever humbles himself like this child, he is the greatest in the kingdom of heaven.“Whoever receives one such child in my name receives me; but whoever causes one of these little ones who believe in me to sin, it would be better for him to have a great millstone fastened round his neck and to be drowned in the depth of the sea." Harming the little ones, Mark 9:42: “Whoever causes one of these little ones who believe in me to sin, it would be better for him if a great millstone were hung round his neck and he were thrown into the sea. Jesus Blesses Little Children, Mark 10:13-15: And they were bringing children to him, that he might touch them; and the disciples rebuked them. But when Jesus saw it he was indignant, and said to them, “Let the children come to me, do not hinder them; for to such belongs the kingdom of God. Truly, I say to you, whoever does not receive the kingdom of God like a child shall not enter it.” And he took them in his arms and blessed them, laying his hands upon them. How we become children of God, John 1:11-13 He came to his own home, and his own people received him not. But to all who received him, who believed in his name, he gave power to become children of God; who were born, not of blood nor of the will of the flesh nor of the will of man, but of God.